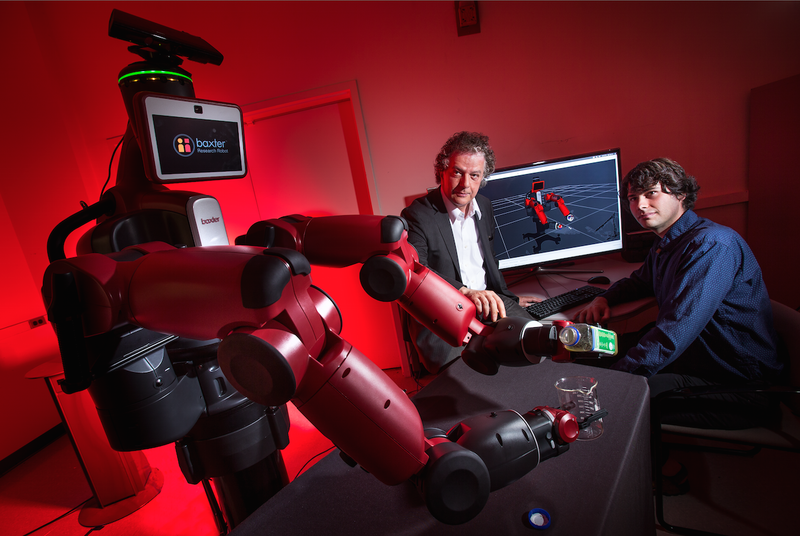 The researchers worked with Baxter, a robot built by Rethink Robotics. Baxter is popular for its safety around humans and ease of use; it can be programmed quickly just by moving its arms, and it is smart enough to adapt to a changing work area. But Baxter’s default software isn’t smart enough to understand a video, let alone recognize the correct measuring cup or ingredient. With the Maryland team’s help, Baxter was able to watch YouTube videos and learn what types of objects to recognize, catalog directions by picking out action verbs and observe which type of grasp would be most effective for holding each tool. Baxter then repeated the steps in the video without any input from its human operators. University of Maryland computer scientist Yiannis Aloimonos (center) observes as Baxter measures ingredients. DARPA, which funded the project, has other applications in mind like military repairs and logistics. Now that Baxter is cooking, there is no word on when the robot will learn to do the dishes.